For other uses, see Overcoat (disambiguation). They are sometimes confused with or referred to as topcoats, which are shorter and end at or above the knees. Topcoats and overcoats together are known as outercoats. Unlike overcoats, topcoats are usually made from lighter weight cloth such as gabardine or covert, while overcoats are made from heavier cloth or fur. In many countries, coats and gowns reaching below the knee have been worn for centuries, often for formal uses, establishing either social status or as part of a professional or military uniform. In the 17th century, the overcoat became widely stylized and available to the different classes. In the Western world, the general profile of overcoats has remained largely unchanged for a long time. During the Regency, the fashion was to have very form-fitting clothes, with sidebodies, waist seams, and a flared skirt. Examples of this included the frock overcoat and paletot. A double-breasted Chesterfield coat with top hat (1876). 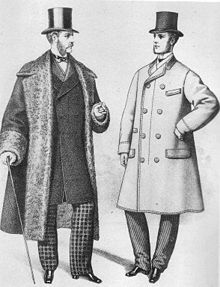 The over-frock coat gradually shifted to the looser styles more common now, typified by the Chesterfield coat, which became popular by the end of the Victorian period. Until then, most coats were double-breasted, but Chesterfields and accompanying styles like the guard's coat were worn in both single- and double-breasted varieties. Napoleon, mounted, campaigning in France in 1814, wearing a grey overcoat, by Jean-Louis-Ernest Meissonier. Overcoats in various forms have been used by militaries since at least the late 18th century, and were especially associated with winter campaigns, such as Napoleon's Russian campaign. The full-length overcoat was once again popularised by the use during World War I of the trench coat. Stereotypically, overcoats used by the army tended to be single-breasted, while navies often used double-breasted overcoats. Overcoats continued to be used as battle dress until the mid-1940s and 1950s, when they were deemed impractical. However, in colder countries, such as the former Soviet Union, they continue to be issued and used. When more efficient clothing and synthetic fibres became readily available, the overcoat began to be phased out even there. Some of the most common historical overcoats, in roughly chronological order. The Greatcoat, a voluminous overcoat with multiple shoulder capes, prominently featured by European militaries, most notably the former Soviet Union. The Redingote (via French from English riding coat), a long fitted coat for men or women. The Frock overcoat, a very formal daytime overcoat commonly worn with a frock coat, featuring a waist seam and heavy waist suppression. The Ulster coat, a working daytime overcoat initially with a cape top covering sleeves, but then without; it evolved to the polo coat after losing its cape. The Inverness coat, a formal evening or working day overcoat, with winged sleeves. The Paletot coat, a coat shaped with side-bodies, as a slightly less formal alternative to the frock overcoat. The Paddock coat, with even less shaping. The Chesterfield coat, a long overcoat with very little waist suppression; being the equivalent of the "sack suit" for clothes, it came to be the most important overcoat of the next half-century. The Covert coat, a classically brown/fawn, straight cut, single breasted country coat that became accepted for wear in the city with a suit as well as with tweed. It has a signature four lines of stitching at the cuffs and hem. It also had a fly front closure and 2 side pockets. The collar is sometimes made of velvet. The British Warm, a taupe, slightly shaped, double-breasted, greatcoat, made of Melton, a heavy wool fabric, was first designed for British officers during the First World War, but was made famous by Churchill. The civilian variant usually drops the epaulettes. This page was last edited on 19 April 2019, at 19:41 (UTC).